It’s too early to know what effects, if any, possible changes at the Orangeville Mall may have on the local business community. As such, some stakeholders seem to have adopted a wait-and-see approach when asked about community conjecture wrought by reports some businesses at the shopping centre have been issued eviction notices. 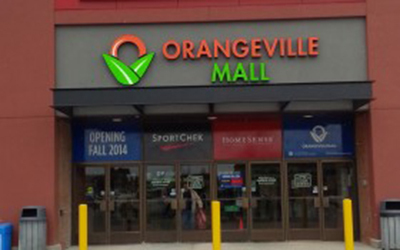 There’s also been reports future development at the Orangeville Mall site could include a pair of large box stores. The Orangeville Business Improvement Area (BIA) is a group of business owners banded together toward stimulating the local business community. Joe Sammut, chairperson of the BIA, said he’s heard many of the rumblings that have come out of the mall. He isn’t certain what impact any rumoured changes will have on the local economy, but he believes there will be benefits. “This may encourage some of the stores to move to areas that are more conducive to shopping traffic,” Mr. Sammut said. There are more than 200 businesses under the BIA umbrella. That jurisdiction encompasses a swath of Orangeville from the Fairgrounds shopping area (where the Walmart, Canadian Tire, and other retailers are located), the Broadway downtown, Lakeview Court and a piece of Buena Vista Drive nearest Highway 10 at the east, and Faulkner Street at its western boundary. The crowd at the Dufferin Board of Trade are also aware businesses at the mall have received eviction notices. Nick Lumia, a communications official and policy analyst at the board, said change is inevitable. The region is growing, he said, and new developments draw new residents. And that’s where the board of trade will be useful. He said the board’s mandate is to connect businesses with resources needed to be successful. That’s at the core of how the board encourages growth within Dufferin County.